This drawing comes from the history entitled, Description of the City and Province of Tlaxcala, written by Diego Muñoz Camargo (ca. 1529-99), a mestizo historian from New Spain. 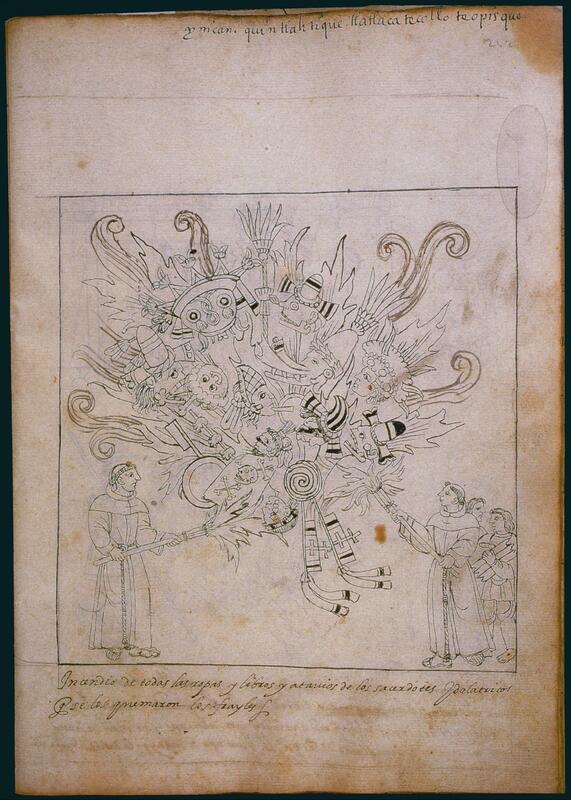 This page depicts the destruction of Aztec deity images and religious paraphernalia at the hands of Catholic friars in the 16th century, shortly after the Spanish conquest. At the bottom of the image, tonsured Franciscan friars, backed by indigenous supporters, put the regalia of native priests to the torch. Within the flames of the bonfire can be seen the masks of specific Aztec deities. The goggle-eyed deity seen at 11 o'clock is the rain god Tlaloc. At two o'clock, a distinctive duckbill mask represents the pre-Hispanic god Quezalcoatl/Ehecatl, associated with knowledge, and manifested in wind. At the top of the page, a Nahuatl text reads: Y[n] nican quin tlahtique tlatlatecollo teopixque ("Here, the friars burned the sorcerers"). The Spanish text below the images is not a direct translation. It reads: Incendio de todas las ropas y libros y atavíos de los sacerdotes idolátricos, que se los quemaron los frailes ("Bonfire of all the costumes, books and paraphernalia of the idolatrous priests, that the friars burnt"). Diego Muñoz Camargo was a native of Tlaxcala and member of native elite. His father was a Spanish conquistador. He wrote his long history as a loyal Catholic servant of the Spanish crown. Tlaxcala, an indigenous city not far from Mexico City, was a long-standing enemy of the Aztec state and it allied itself with Hernán Cortés during the conquest. The city and its elite thus occupy an unusual place in Spanish American history. The drawing is done in pen on smooth sheets of European paper by unnamed artists who worked to illustrate Diego Muñoz Camargo’s original manuscript. The style of the drawing echoes the crisp linear precision of pre-Hispanic paintings, and most, if not all, of the illustrations of the manuscript were drawn from paintings and murals in public buildings in the city of Tlaxcala, where Muñoz Camargo lived. The writing on the manuscript, Spanish below and Nahuatl above, was completed by different hands. The presence of these two texts reinforces the idea that Muñoz Camargo’s history was a project invested in registering pre-Columbian history meaningful to both a European reader and a Nahua one. Diego Muñoz Camargo wrote a long history in response to a Spanish government questionnaire sent to the colonies in the 1580s. Most of these replies, today called the Relaciones Geográficas, were brief, but Muñoz Camargo’s reply was a book-length disquisition, complete with illustrations. Muñoz Camargo took his manuscript to Spain, and there left a copy of the text and the originals of the illustrations, probably in the hands of King Philip II himself. This work eventually passed from the collection of the Spanish monarchs to the Hunterian Museum Library at the University of Glasgow, where it is now housed. Muñoz Camargo would continue editing and amending his text for the next decade, to create a work now known as theHistoria de Tlaxcala. In pre-Hispanic times, Aztec priests and select deity “impersonators” would transform themselves into particular deities by preparing themselves ritually and then donning the appropriate masks and paraphernalia. Catholic priests tried to close down this conduit to an indigenous otherworld by banning ceremonies, destroying paraphernalia and punishing participants. Bonfires such as the one shown here were held across Spanish America in the 16th century and painted books, ancestor bundles and other relics sacred to indigenous peoples were publicly destroyed. While some indigenous accounts focus upon the horror and public grief at the burning of pre-Hispanic objects, expressed through tears and cries, Muñoz Camargo takes a different position. As a Catholic and a loyal servant of the Spanish crown, he supported this destruction of the “idols,” as he called them. He also, in the meticulous rendering of them in the picture, preserves their memory. His history thus betrays some of the complexities of history-writing for Christianized natives of New Spain. Brotherston, Gordon, and Ana Gallegos. 1990. 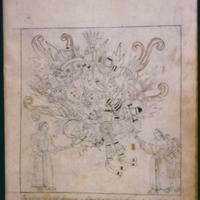 “El Lienzo de Tlaxcala y el manuscrito de Glasgow (Hunter 242).” Estudios de cultura Nahuat l 20: 117-140. Mundy, Barbara E. 2014. “Extirpation of Idolatry and Sensory Experience in Sixteenth-Century Mexico.” In Sensational Religion: Sensory Cultures in Material Practice. Sally M. Promey, ed. New Haven: Yale University Press, 515-535. Muñoz Camargo, Diego. 1982-1988 [c. 1581-84]. “Descripción de la ciudad y provincia de Tlaxcala.” Relaciones geográficas del siglo XVI: Tlaxcala, vol. 4. René Acuña, ed. Mexico City: Universidad Nacional Autónoma de México.